From Panvel we catch the Train no 2133 (Mumbai Karwar Express) at 11.45 pm. Ajit was with us till the train Left for Goa. 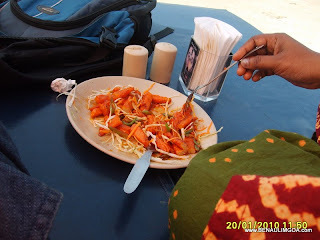 We reach Madgaon Station at 9 am (2hour late) and had our breakfast at the station resturant. Hired an Auto Rickshaw (Damu) @ Rs 130 from the station to OSHIN HOLIDAY CARE. After I reached OSHIN, met with Mr Inacio Fernandis, the Proprietor, and asked for the double occupency room, which he showed and finalized for next three days stay. A Well the room is having little amenities with hot water shower and two beds. My Satisfaction get a high when I get the best bargain price for my stay which you cant get otherwise in Beach Resorts, in these peak seasons. OSHIN is 20 minutes walk from Benaulim Beach. Its inside the Benaulim and there are Bicycles and Bikes available with Rs 50/- and Rs 250/- per day respectively to hire, and it takes just 5-10 minutes to the white sand Benaulim beach. 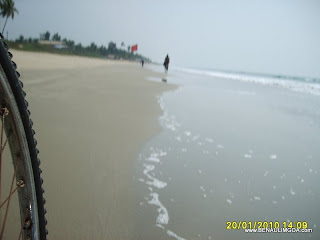 A recommendation for the Visitor to the Benaulim Beach is , to take the best of Time with a bicycle ride to the nearby places and the Beach itself.